Josh and I made our way up to Asheville, North Carolina to celebrate our one year wedding anniversary and oh my goodness, I tried to tell Josh that I would stay and find us a place to live while he came back to Columbia to get Murphy and bring him back...but that didn't exactly work out as planned, haha! All joking aside, I love the mountains. The scenery is truly breathtaking and I could imagine myself living near mountains forever. Asheville stole our hearts and we can't wait for our next trip back! For our anniversary we visited the Biltmore and my heavens, what a beautiful place. The grandeur of the home was beyond imagination. And the grounds, absolutely stunning. We absolutely loved wandering around the home and exploring the grounds. There was SO much to see, I'd love to go back in the near future. When we were having lunch at the house it felt like we were in another time, another land. It really was gorgeous. We also made a visit to the Biltmore winery and the little "town" that surrounds it. Josh is not a wine drinker at all, but wouldn't you know he found a white wine he liked so much that we came back with a bottle? The girl that assisted us with the tasting was fantastic and made our experience so enjoyable. We asked her so many questions about wine and she happily answer all of them! The area where the winery is was so neat. They had a live band playing and different exhibits, shops and places to eat. I should also mention we went on the most beautiful day we've had in awhile. It poured rain on us leaving Columbia but once we hit North Carolina, it was nothing but blue skies and a cool fall breeze, perfection! We didn't make any set dinner plans before we went but I had mentioned to Josh a few times that I had heard the Sunset Terrace at Grove Park Inn was great, and that GPI was a neat place to go see. So, we called at 4:45 to see if they had any reservations for that evening and sure enough they did, at 5:30. So we booked it from the Biltmore to the Grove Park and after a mad dash from the parking lot, practically running up a hill and flying through the front doors of the hotel, we arrived at the Sunset Terrace at 5:28, just in time for our reservation. As soon as we walked outside to the seating area, my mouth dropped open. The view we had was incredible. The dining room is nestled inside an outdoor stone type structure overlooking Asheville and the mountains. Josh and I just kept looking at each other and giggling, so in awe of the view we were going to get to enjoy at dinner. The food was delicious and our waiter, goodness gracious, the sweetest man on the planet, I'm certain. 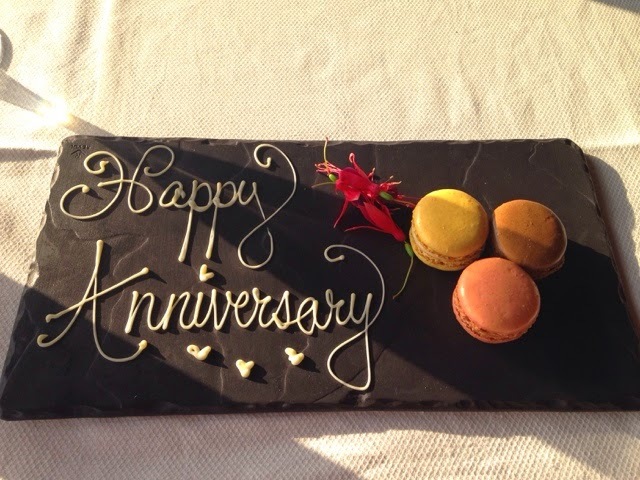 They brought us out anniversary macaroons to end the evening, our first taste of macaroons ever and...we might be hooked. SO GOOD! We're anticipating our next trip back to Asheville, on the drive back to Columbia we both decided that if we had to choose between the mountains or the beach, the mountains take the cake every time! It was SUCH a great first anniversary and I'm so glad we were able to venture to somewhere new. Asheville, we'll be back soon!